Kaja Osholm Kjølås created a climbing tree inspired by the Scandinavian forest. This artful climbing tree has stylized branches that can be combined in any shape that you desire — mimicking the same idea behind the pegs used for indoor rock climbing walls. You create your own adventure for your child and secure it to the wall in their bedroom or playroom. The tree will stimulate imagination, coordination, concentration, and discovery, all while your child is taking playtime to new heights. Your younger children ages 3 and up will enjoy the way that you can reconfigure the tree for climbing fun — you’re in charge of how high the top branch, and thus your child, will go off the ground. And your wee little ones can hold onto pieces of the tree while learning to pull themselves up or while learning how to walk. After your child outgrows the fascination with the climbing element, it can be used to hang clothing, backpacks, hats, bags, and mittens extending its life. I wish I were still a kid so I could climb that! Any idea where you can buy this?? Where can I buy the climbing tree? Kaja Osholm Kj�l�s created a climbing tree inspired by the Scandinavian forest. 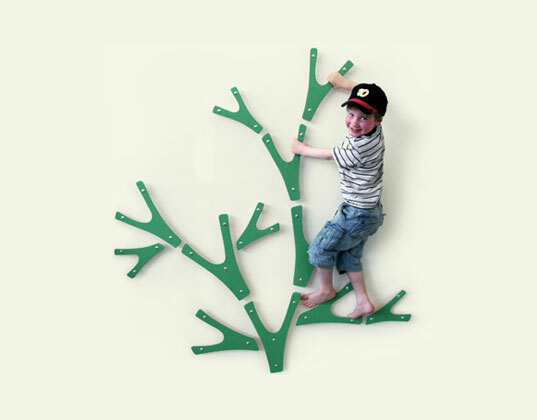 This artful climbing tree�has stylized branches that can be combined in any shape that you desire -- mimicking the same idea behind the pegs used for indoor rock climbing walls. You create your own adventure for your child and secure it to the wall in their bedroom or playroom. The tree will stimulate imagination,�coordination, concentration, and discovery, all while your child is taking playtime to new heights.